Along its considerable coastline, Italy has 27 "protected marine reserves" (AMP is the Italian acronym for Area Marina Protetta.) These reserves aim at protecting marine and coastal flora and fauna by restricting human activities in the area. The reserves are generally divided into zones with restrictions of varying severity applying to each. Most of these protected reserves have been created by ministerial decrees within the last 10 years. 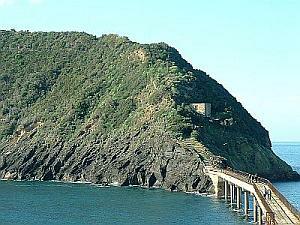 The Campania region of Italy (of which Naples is the capital city) now has six such reserves: the reserve at Punta Campanella (at the end of the Sorrentine peninsula); the underwater park at Baia (on the western side of the Bay of Pozzuoli, the bay across from Procida), the underwater park of Gaiola (on the Posillipo coast), the reserve of Santa Maria di Castellabate (in the province of Salerno near Agropoli), the reserve of the Infreschi and Masseta Coast (on the Cilento coast in the province of Salerno, near the towns of Camerota and San Giovani a Piro), and the reserve Regno di Nettuno (Neptune's Kingdom) (comprising some of the shoreline and coastal waters of the Flegrean Islands at the western end of the Gulf of Naples (that is, Ischia, Procida and the latter's smaller satellite island of Vivara.) (map, above). This last may serve as an example of the attempts being made to safeguard the marine environment. There are seven towns on the three islands, Ischia, Procida and Vivara that have parts of their municipal coastal areas included in the Regno di Nettuno protected marine reserve. These towns are Barano d'Ischia, Casamicciola Terme, Forio, Ischia, Lacco Ameno, Serrara Fontana, and Procida. The first six are all on Ischia. The protected land area of the entire marine reserve is just over 52 square km (just over 20 sq. miles); the protected waters cover an area of around 11 hectares (around 27 acres). The reserve has five different zones of protection, each with its own restrictions; they are designated A, B, B.n.t., C and D, with zone A being the most restrictive. Some general restrictions, however, apply to all of the areas, regardless of zone: unless otherwise provided by law, the various species of plant and animal life may not be disturbed. There is no bathing, navigation, mooring, docking, use of marine engines, or water skiing. Animal and plant life may not be damaged or taken. Neither archaeological nor geological samples may be taken or disturbed. Dumping of any sort of toxic or polluting substance onto the land or into the water is likewise prohibited. Open fires may not be used. Zone A (most restrictive) comprises the coastal waters on the west coast of the island of Vivara (that is, facing Ischia) and those near the Catena shoal at the southern end of the Ischia channel. The only activity permitted in those waters are rescue, surveillance and maintenance operations. Zones B and B n.t. 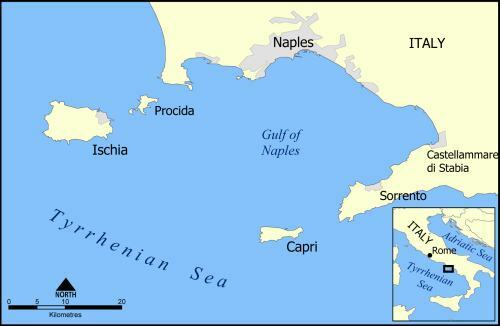 (less restrictive than A) - This is the "general" reserve, including the waters in front of eastern coast of the island of Procida, all of the waters around the island of Vivara, the Ischia Bank (off the south-eastern coast of Ischia), and the waters in front of various designated points around the island of Ischia. These areas permit bathing, snorkeling, scuba diving, boats under sail, rowboats and, with some restriction, motorized passenger access to cruise vessels, mooring and anchoring at specified spots, local commercial fishing, sport fishing and aquafarming (i.e., the cultivation of fish, crustaceans, molluscs and aquatic plants for commercial purposes. Zone B.n.t. (standing for the English term "no-take) is part of zone B, however, and here there are absolute prohibitions of all professional or sport fishing, unauthorized sport diving, and aquafarming. Zone C is actually a partial reserve area. It comprises the rest of the waters around the three islands with the exception of the Procida channel and some waters north of Point Imperatore on the island of Ischia. Most of zone C is, thus, open to to sport boating, sport fishing and mooring in authorized areas. Zone D exists mainly to safeguard marine mammals and is located for the most part in the so-called Cuma Canyon, off the north-western coast of the island of Ischia. Net and trawl fishing is permitted. Marine mammals may be observed. A new website has opened here named Regno di Nettuno Area Marina Protetta (AMP is the Italian acronyn) (Kingdom of Neptune Protected Marine Reserve). Under the rubric of "Citizen Science" it invites everyone from beachcombers to professional divers and marine biologists to keep an underwater eye out for anything of interest. This includes, but is not limited to, injured turtles, alien species (maybe unusual flora and fauna or the Google translators who tried to put some of the site into English! ), discarded fishing gear -- anything that requires attention. The site is user-friendly and you can report whatever you want. The site is run in collaboration with the Zoological Station of Naples (the large aquarium in the middle of the Villa Comunale on the Chiaia seafront and the separate Villa Dohrn station on Ischia. They will check the reports and take appropriate measures.